We have all driven by Paul Mitchell the School Modesto on McHenry Avenue. It looks like a very modern, high-class building that can be, let’s admit it, a little intimidating. Almost like Aperture Science Industries from the video game Portal. I can attest though that once inside, you walk into an inviting atmosphere, comforted by soft light as you fall into comfy couches. They look so modern because they have all the high tech gadgets you could need for skin, hair and body care. The sleek Paul Mitchell logo greets you as you walk in. Decorated by smooth counter lines, bold white and black textures, lighted mirrors, it is both modern AND laid-back. I was invited to attend the Open House on Thursday May 7th, and take a tour of the facility with the owner, Rosemary Safavi. 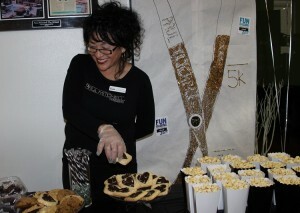 Delicious treats from the Open House. Team of greeters at Open House. 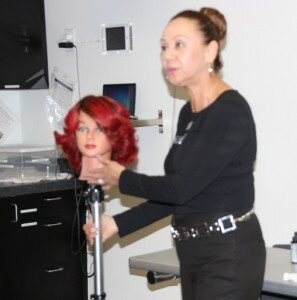 Rosemary earned her Cosmetology License and Cosmetology Instructor Licenses after attending Lyle’s College of Beauty in Fresno, California, 34 years ago. 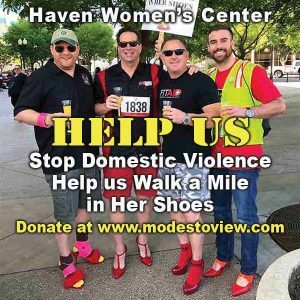 She has owned and operated the Modesto school for 11 years. She not only knows her trade, she loves to share her knowledge and secrets with the up and coming generation, so they can discover new HG (aka “holy grail”) beautification techniques. She doesn’t just mean outside beauty, but deep inside beauty that make us all unique and special. These were made by students in the color class. 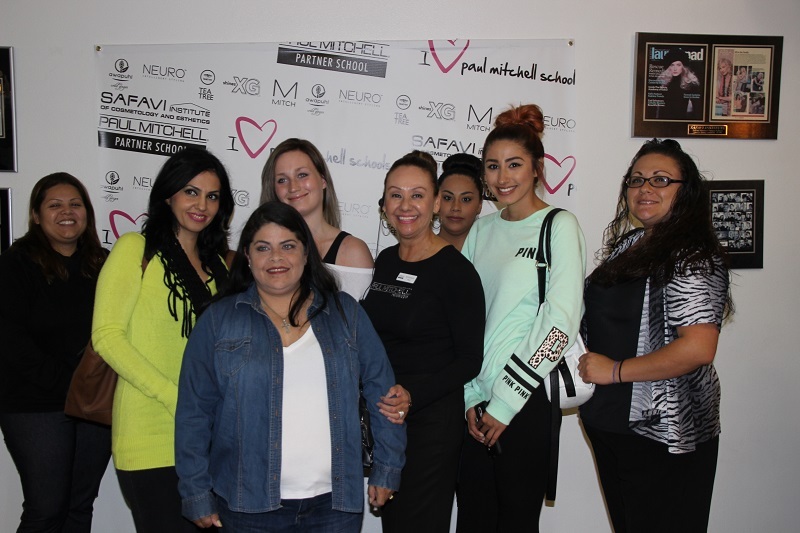 They embrace each student as an individual, and let the student use their ideas, theories and concepts to further the Paul Mitchell ideology. As you would except form a school, students learn the basics and get hands-on experience, but Rosemary also makes sure they know business strategies, budgeting, goals, and customer service. Each student receives an ipad upon enrolling, so you can learn all the techie skills necessary to start your own youtube channel, podcast, blog, and start an online portfolio. I was escorted into every classroom and shown how they teach various aspects of the field from hair color, weaving, waxing, manicures, facial massage, down to discovering and embracing self-esteem, and even life goal planning. 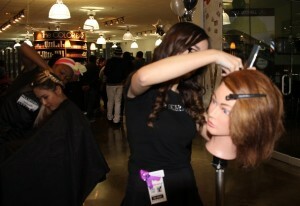 Text books can teach only so much; most of what the student learns is hands-on through the salon they have on site. 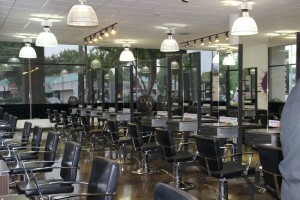 The salon room is big enough to hold 50 students and 50 clients. It’s ginormous. Each client gets the full experience of a good pampering. 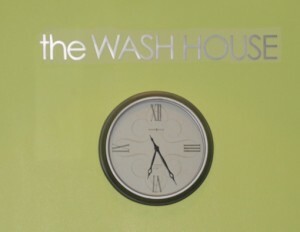 You start in the wash house with a 7 minute scalp massage, being serenaded by pleasant relaxing music during your wash, before being magically whisked away wrapped in warm towels to your seat for your cut and style. They take appointments and walk-ins, for both salon and Dermalogica skincare services. If you’re hesitant, you should check out their reviews on Google. They have 101 reviews currently, with a 4.6 rating. That’s pretty awesome. 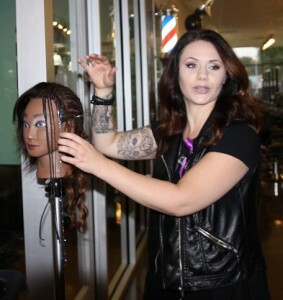 Anne-Louise (Cosmetology Learning Leader and Texture Specialist) showing how to weave bling into your braids.